The Outfitter II is a bruiser in big water! 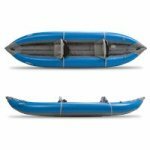 The large tube diameter and low seat position make the Outfitter AIRE’s most stable and forgiving two person whitewater kayak. It plows through whitewater and is perfect for novice kayakers just getting a feel for the sport or the big water experts who need a beefy boat. 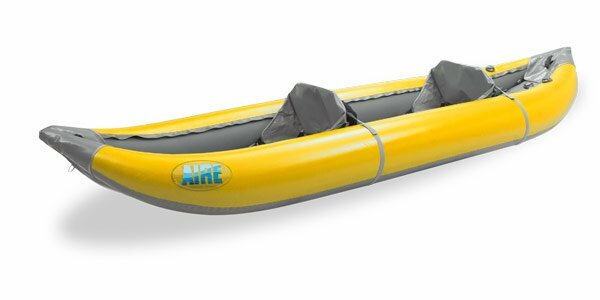 The large tube diameter also increases the kayaks load capacity, and extra gear straps into 17 sets of cargo loop for overnight river trips and expeditions. The comfortable cheetah chairs provide excellent back support and come with cargo pockets in the back for packing water, snacks, or extra layers. 10% Off on Accessories offer is for in store only!Â Not online purchases. Length x Width x Height: 12'5" x 41"
Bow Rise x Stern Rise: 18.5"